Constellation Centaurus the Centaur, sits south of constellation Virgo, between Argo Navis and constellation Lupus. Centaurus contains 10 named fixed stars. Centaurus is one of the largest constellations, spanning more than 60 degrees in length in the zodiac signs Libra and Scorpio. The stars of Centaurus give intelligence and wisdom, with a talent for the sciences such as botany, medicine and astronomy, plus skill in music and divination. Centaurus makes people full of energy and very passionate, but with a tendency toward revenge. 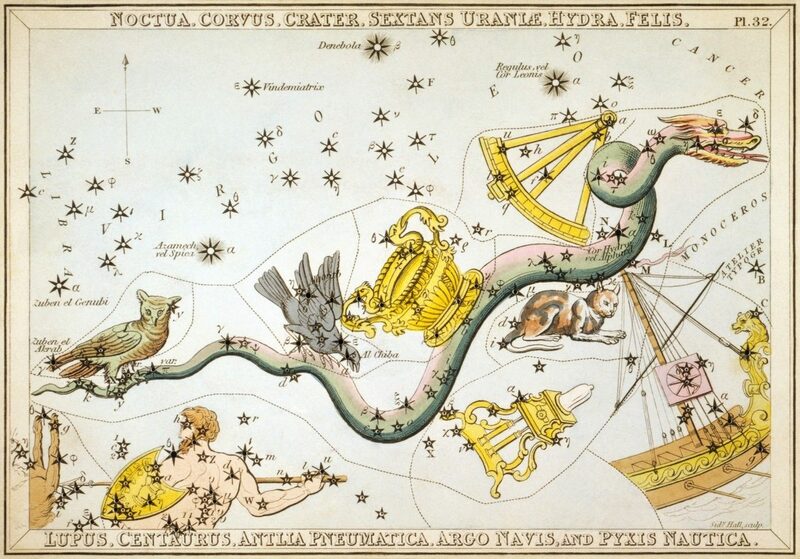 The constellation has been associated with weapons and poison. The stars in the human part of Centaurus, such as Menkent, have a Venus and Mercury nature making these people good looking and intelligent with psychic abilities. The brighter stars in the horse part of Centaurus have the planetary nature of Venus and Jupiter. These fixed stars, mainly in the legs like Agena and Toliman, give a more refined nature with good health and a fortunate love life. The constellation contains thirty-five stars. Two of the 1st magnitude, one of the 2nd, six of the 3rd, nine of the 4th, etc., which, together with the four bright stars in the CROSS make a brilliant show in southern latitudes. Another name for the constellation was in Hebrew, Asmeath, which means a sin-offering (as in Isaiah 53:10). The Greek name was Cheiron, which means the pierced, or who pierces. In the Greek fables Cheiron was renowned for his skill in hunting, medicine, music, athletics, and prophecy. All the most distinguished heroes of Greece are described as his pupils. He was supposed to be immortal, but he voluntarily agreed to die; and, wounded by a poisoned arrow (not intended for him) while in conflict with a wild boar, he transferred his immortality to Prometheus; whereupon he was placed amongst the stars. We can easily see how this fable is the ignorant perversion of the primitive Revelation. The true tradition can be seen dimly through it, and we can discern Him of whom it spoke,–the all-wise, all-powerful Teacher and Prophet, who “went about doing good,” yet “despised and rejected of men,” laying down His life that others might live. 1. Star Names: Their Lore and Meaning, Richard Hinckley Allen, 1889, p.148-151. 3. The Witness of the Stars, E. W. Bullinger, 3. 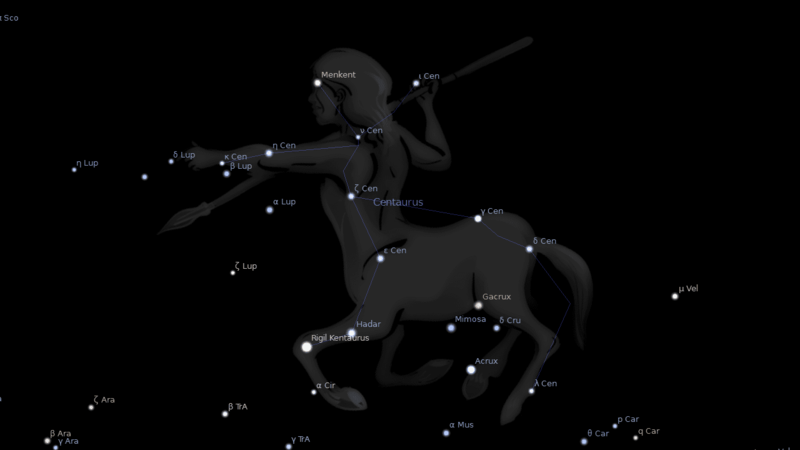 Centaurus (the Centaur).